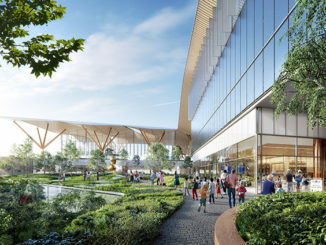 The project included a redevelopment and open space plan for a 180 acre area along the Mississippi River north of the Gateway Arch in St. Louis, Missouri. The project was developed by a team of landscape architects, planners, market and economic analysts and engineers all in collaboration with a highly engaged client team consisting of the Great Rivers Greenway District, the City of St. Louis Planning and Urban Design Agency, and St. Louis Development Corporation. Through analysis including environmental, social, cultural and economic study a series of development strategies were created that were the basis for the plan framework regardless of land use. Strategies included: 1) Engaging the river 2) Connecting to the Central Riverfront 3) Enhancing view sheds 4) Extending the greenway network 5) Leveraging the City’s new front door at the Stan Musial Veteran’s Memorial Bridge 6) Strengthen the street grid 7) Linking to public transit 8) Catalyzing on the existing building fabric 9) Harnessing the energy of the river. The plan is envisioned as a collection of smaller, more organic developments, seeded across the site, as market opportunities make possible, woven together in a common framework, leveraging their interdependence. 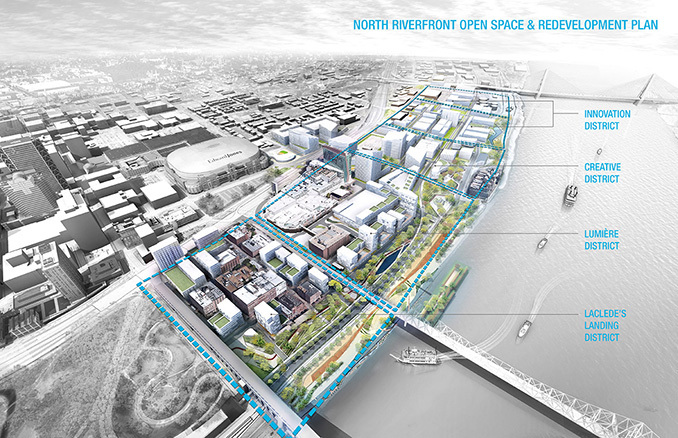 The plan incorporates four districts organized around their unique context: Laclede’s Landing District, Lumiere` District, the Creative District, and the Innovation District, each linked by a continuous riverfront park that connects the Arch Grounds to the North Riverfront Trail. This new urban oasis provides the opportunity to be an active, highly programed, and active park in contrast to the calm, monumental essence of the Arch Grounds. 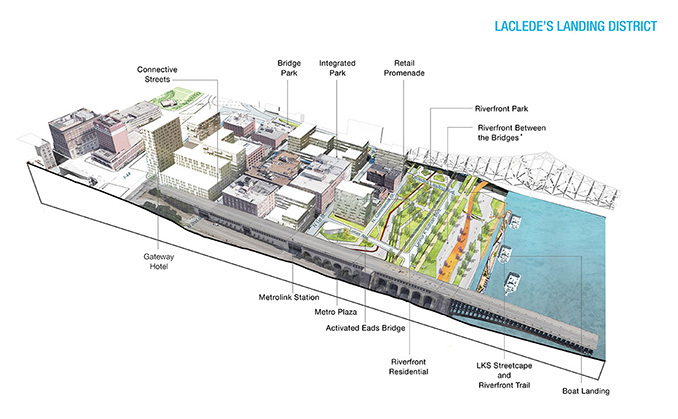 In LACLEDE’S LANDING, the plan includes a reinvigorating an historic urban fabric, working with strategic mixed-use infill and new residential, to create a defined urban destination. This location is also proposed to include a docking facility for visiting boats, once again bringing back to life ‘this important landing. 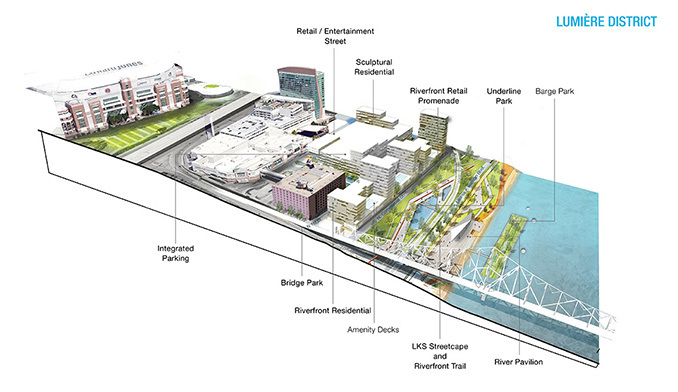 In the LUMIERÈ DISTRICT, the plan connects the casino to the riverfront park with new integrated entertainment, retail, parking, and residential uses. This location also provides a unique opportunity to add additional open space and amenities in the form of barge parks, protected from river traffic by the existing river cells. This mosaic of barge parks could assemble and reassemble to change offerings, even allowing for the participation of barges from other river cities, creating the opportunity for a new level of culture exchange reminiscent of its historic thriving past. Imagine a barbecue barge from Memphis connected to a music barge from New Orleans, and a sculpture garden from Minneapolis. In the CREATIVE DISTRICT there is an opportunity to re-imagine historic buildings as creative studios, an Eco-Energy and River Research Center, all wrapped around a Multi-Media Plaza. This a space for large outdoor events in front of an animated power and light building, a venue for the types of gatherings not suitable for the Arch Grounds. Finally, in the INNOVATION DISTRICT, we find an activated Broadway gateway, live-work space to create a community of innovation, all organized, around a collaboration park, which is designed to recall and celebrate the historic Osage Nation mounds that once existed around this location. Specifically, the plan recommends the extension of an open space system. Building on the success of the CityArchRiver investment, this new public realm will create stronger connections to the river and adjacent communities, provide a variety of new recreation and mixed-use opportunities, and become the new ‘poster-child” image of the resurgence of this destination in our City. The plan also establishes a new network of streets, improving the connectivity and access to sites, serving as a framework, which can adapt and evolve to market change and future development possibilities. The plan describes multiple land uses, completely mixed and mingled to optimize and leverage their specific adjacencies bringing to life a new vibrant “place to be”. The project’s goals and objectives were to develop a vision for the riverfront which would fully leverage its location and rich history, to develop a world class destination community where one can live, learn, work and play. At the project’s core is a network of safe, meaningful and well linked open space that connects not only the blocks within the project area but connects to the river, back to the city, and to the adjacent neighborhoods. 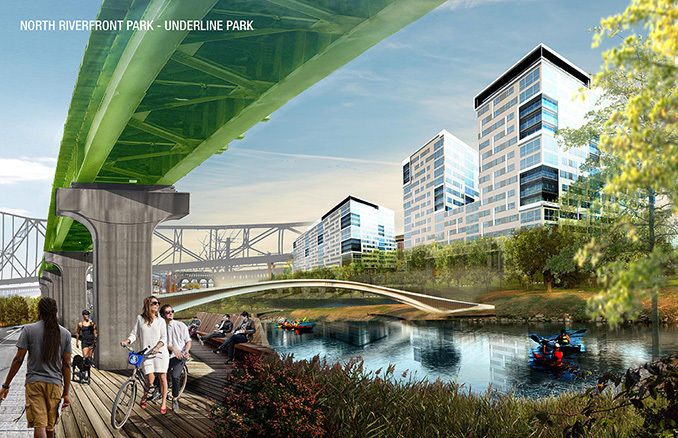 The program or goals and objectives of the project were to create a new and exciting, world-class riverfront destination, reconnecting our community to its most important asset, and re-energizing the STL brand as one of the great American river cities. Optimize utilization of the land with an appropriate mix of attractive uses, where all can Live, Work, Learn and Play…creating equitable opportunities for continuous improvement to grow our prosperity. Develop a place-based plan that responds to the local and regional context…leveraging the historical, cultural and natural assets of this district. Create a clear hierarchy of safe, well-connected, and meaningful open space, a broad array of transportation options, linking this district to the river, downtown, the adjacent neighborhoods and the river ring. Create a flexible plan that allows for future growth and phased development…that can adapt to market changes and evolve over time. Ensure this “eco-district” leverages the City’s Sustainability Plan and promotes environmental, social, and economic sustainability. Re-connect people to nature enabling a healthier, more environmentally savvy community, providing recreation opportunities, and improving overall well-being. Facilitate an inclusive and accountable planning process to provide opportunities for public and stakeholder input, and truly implementable outcomes. 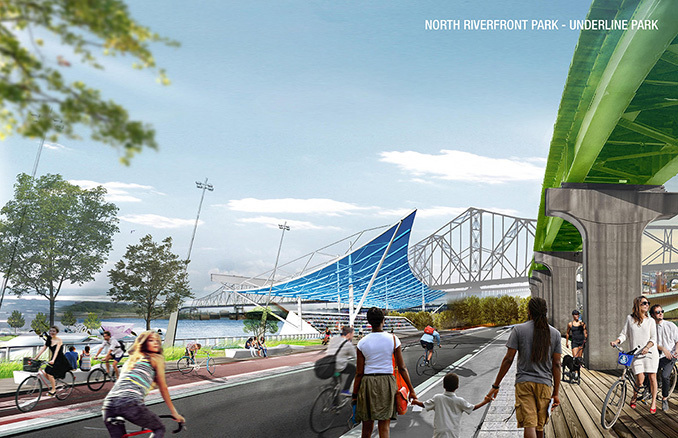 In the fall of 2015 the North Riverfront Redevelopment and Open Space Plan was adopted by the City of St. Louis Planning Commission as a Topical Plan and the plan was adopted as well as a plan of action by the Great Rivers Greenway Planning Board.